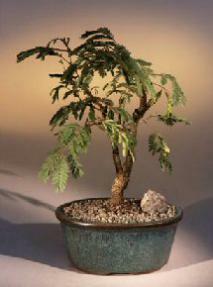 The Mimosa loves sun and is drought tolerant. It folds its leaves under water stress, preventing water loss and under severe conditions it will defoliate until the rains return. The Mimosa can bloom throughout the year. 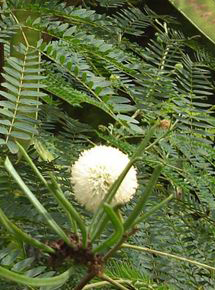 Flowers are white with a white base, looking like white pom poms and are self-fertilizing. It takes about four months after flowering for the long flattened pods to mature and liberate seeds. The Mimosa seeds have a hard coat which requires scarification (abrasion) and germination is usually 6-10 days after sowing. Fun tree and easy indoor care.